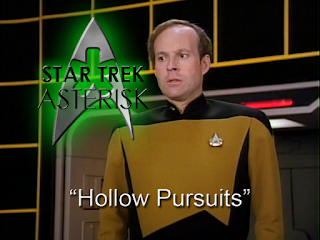 Star Trek: Asterisk "Hollow Pursuits"
Star Trek writer, Sally Caves, predicts the effects of tech addiction coupled with social anxiety with scary accuracy by introducing Lt. Barclay. Presume for a moment that you are a nerd; socially anxious, reclusive stutterer with a genius level IQ and creative tendencies. Presume also that, instead of sleep, you enjoy a rousing 20 hour game of The Sims in which the people you know in everyday life are recreated for your amusement. You are Lt. Barclay, who, in the first five minutes of this episode, we see kicking both Geordi's and Riker's butts and wooing Dianna Troi in a holodeck fantasy version of 10-Forward. Then he's called to the cargo bay where he meets the real versions of them and promptly turns into a scared puppy. But a scared puppy with a job to do: find out why the anti-grav sled isn't working. While Barclay gets to work on the sled which was carrying canisters of alien tissue samples, Geordi goes to the captain to complain about him. This is where Geordi slips and calls him "Broccoli," which is, apparently, something that Wesley started. And which Picard would like to see stopped in its tracks. Broccoli has been late to work several times and just acts weird around other people. So Picard suggests that Geordi makes the lieutenant his pet project. With that in mind, Geordi invites Barclay to a meeting in engineering, to which he is also late. Barclay is slow to pick up on the social cue that Geordi wants him to report on his progress with the anti-grav sled, and then stutters while trying to explain it. And then Wesley chimes in. "I--... I was--... going to do that." Harboring resentment now toward Wesley (and, let's face it, who doesn't? 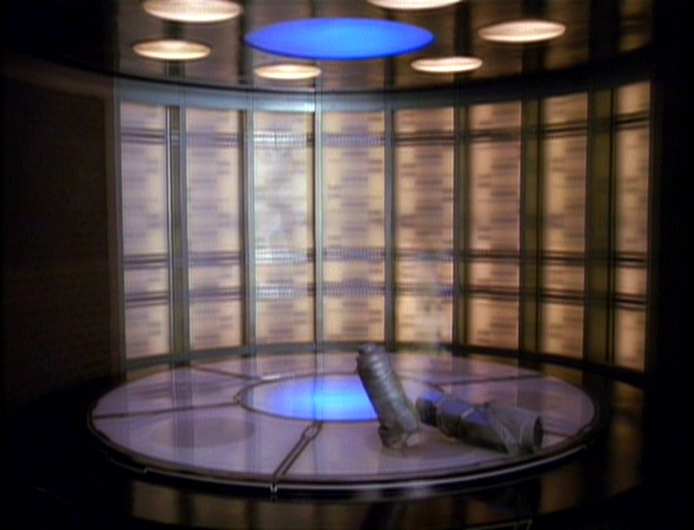 ), Barclay goes to see Troi. The holo-Troi who's in love with him. They have a normal counseling session for a while until Barclay decides he wants a more fantastical scene, so he changes it to a forest setting in which Troi is the "Goddess of Empathy". Meanwhile, in 10-Forward, the engineering team, including Wesley, finds one of their drink glasses warped and leaking. 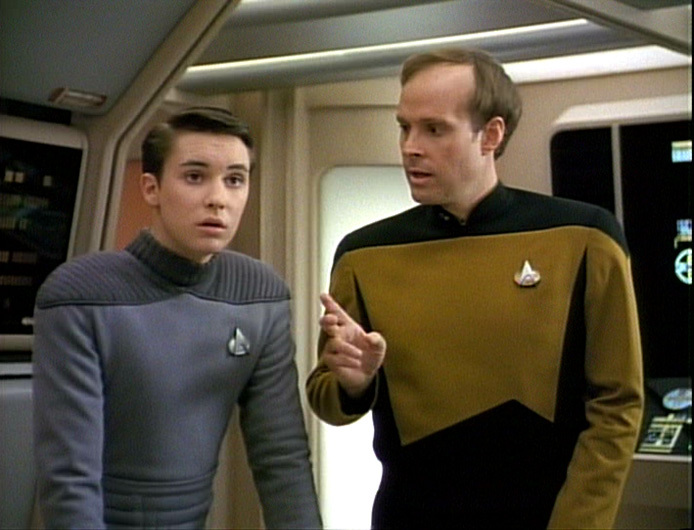 Geordi and Data determine it must be a power systems failure, so Geordi assigns Barclay to overhaul all 400 of them. When Picard asks if that will have any negative effect on ships systems, he accidentally calls Barclay "Broccoli," and now the secret's out. After talking to Guinan about Barclay, Geordi decides he really needs to befriend him, if for no other reason than to help him get his work done. 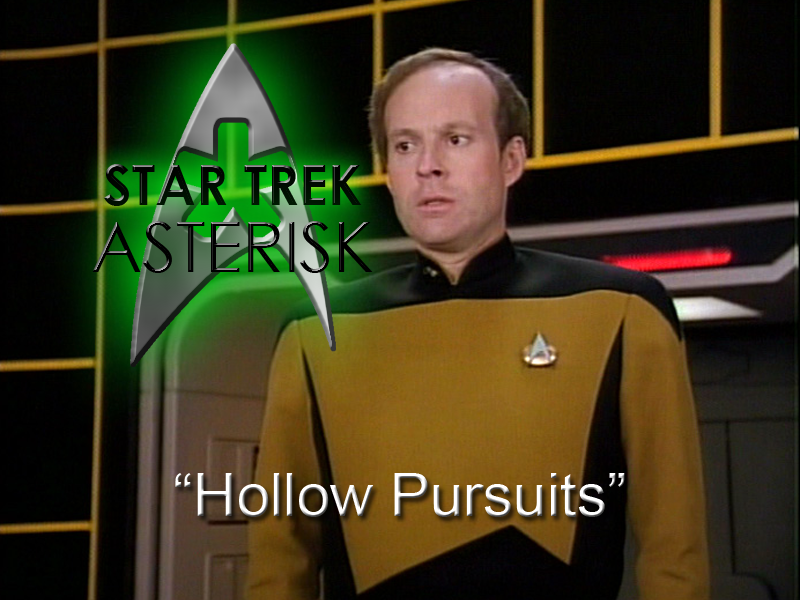 So he goes looking for him in the holodeck where he finds all of Barclay's fantasy crew in fantastical costumes with holo-Data, holo-Geordi and holo-Picard as, basically, the Three Musketeers and holo-Wesley as Little Boy Blue. Geordi catches Barkley in the middle of sparring with holo-Picard and then goes to have a talk with him in 10-Forward. And while they discuss talking to the real Troi about holo-addiction, O'Brien finds a fault in the transporter system. Visiting Troi, Barclay learns how to breathe to calm himself and then abruptly leaves, clearly preferring his holo-Troi to the real one. 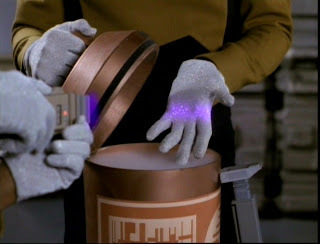 Picard believes that the anti-grav sled, the warped glass, and the broken transporter may all be related, so Riker, Troi and Geordi go to find Broccoli in the holodeck where they immediately run into the "Three Musketeers" and mini-Riker. Riker doesn't like it, but Troi tells him not to completely take away Barclay's fantasy world because of the effects it might have on Barclay. She feels that way right up until she meets the "Goddess of Empathy". They eventually find Barclay resting in the lap of holo-Crusher. Just then, another systems failure causes the ship to accelerate. Barclay needs to get to engineering as soon as possible. In a quick meeting, Barclay out-thinks the other engineers by reasoning that there isn't a systemic solution, so maybe it's one of them. Maybe they were causing the failures by touching the systems after being contaminated by something the sensors couldn't pick up. Geordi narrows down the list of 15,525 un-sensible elements to 5 that could warp glass and exist in an oxygen atmosphere and just 2 that wouldn't have killed everyone. One of them they find exist in tissue sample containment units that were being used on the anti-grav sled. Barclay says they have to reduce this element to −200 °C across all the systems it has affected and it will become inert. Who knew Michael Jackson's glove would come in handy? After saving the day and slowing the Enterprise down to normal speed, Barclay says a final goodbye to his crew. His holo-crew. After a heartfelt speech, he turns off the holo-program and starts to leave.... but then he turns around and tells the holo-deck to keep program 9 in tact. With a smug grin, he walks away into a fade-out. I love this episode. I really wanted to spend some more time with Barclay. I don't know anything about Sally Caves, the writer of this episode, but if she's anything like the average Trekkie of her time, I would guess that Barclay is her Mary Sue, except that she does it completely convincingly. Barkley is the nerd that every nerd wants to turn out to be: shy and unnoticeable at first, but, in the end, saves the day through the power of his genius, and, through it all, more creative and imaginative than the rest of the crew put together. I dunno, I've just really gained an affection for Barclay and he may be my favorite TNG character next to Data.